This is the main image for the whole magazine for it is the main image on the front cover and basically sets out the vibe and theme for the whole magazine. 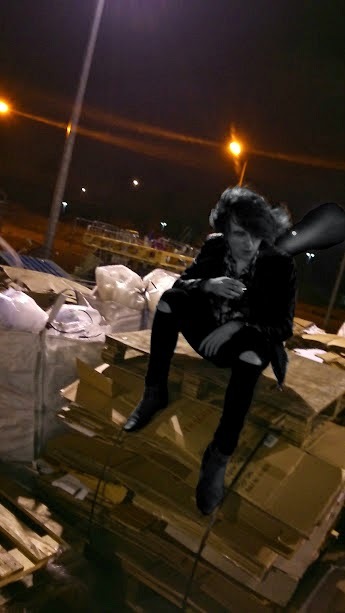 I took it late at night behind some shops on-top of some old crates and boxes so the whole urban background really helped. Because the theme of my magazine is hard rock I had to make the main image represent that, and I believe I did. I was wearing a shirt, boots, ripped jeans and a leather jacket to try and get an authentic rock look and was also holding a fake cigarette also for that can be related to the hard rock style. Then I put the photo into Pixlr and made myself black and white, it links in with the article on the model and how he could be seen as an outcast. And the black and white also matches with my magazines colour scheme, and dark colours in general could be related to rock music.